Do you have the writing chops to seek out and deliver compelling stories on the latest in music, art, food, beer, politics and current events in Richmond? 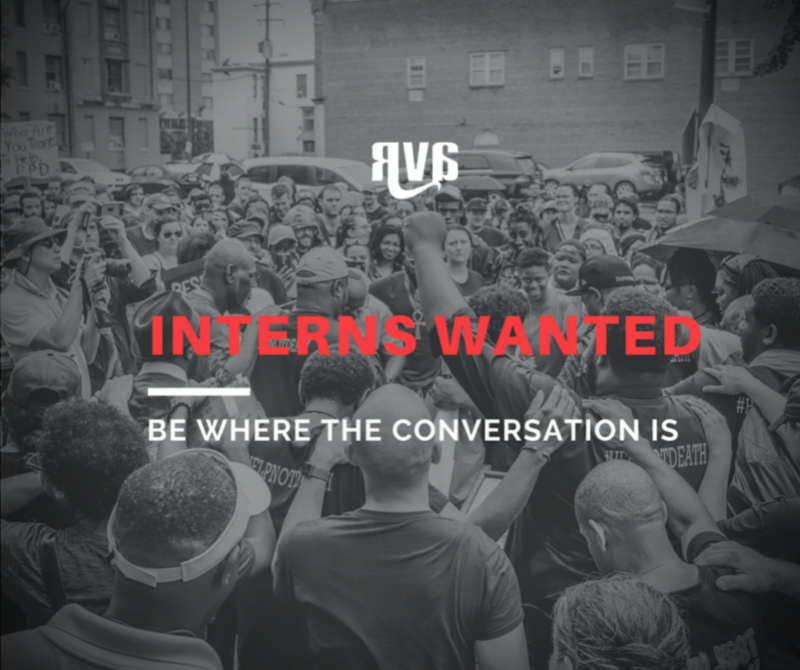 Well, you’re in luck, because RVA Magazine and GayRVA are opening positions for editorial, graphic design, and video interns for our upcoming Spring 2019 season. Launched in 2005 as a zine to promote the bubbling revival of Richmond’s underground, the RVA regional brand started with RVAMag. RVA Magazine and GayRVA are now Virginia’s largest independent media and the region’s voice for arts, entertainment, and cultural news. We are always seeking to diversify our newsroom: LGBTQ and minority students are very much encouraged to apply. Both publications have several openings for writers and creatives who are passionate, hard-working, and excited to learn under the guidance of Virginia’s largest independent media outlets right here in Richmond. We welcome your ideas, and will open doors to interview artists, musicians, politicians, and local influencers with opportunities to pitch your own ideas as well. Writers can attend and cover shows, write features on artists, and report on musicians, craft beer pros, restaurants, films, theater, fashion, politics, and more — right here in the River City and across Virginia. Juniors and Seniors studying Journalism will receive first priority consideration. Internships are unpaid and for-credit if requested, with potential opportunities for contributors following the internship. Attending a college program is not required, but those not in a program should be able to show a history of successful writing or commitment to a long-term project. Writing – Interns will draft 1-2 articles per week: News writing, event previews, interviews of artists or musicians, album reviews, features on new businesses and local stories, political updates. Interviewing – You will be speaking to lots of different people. The voices of the city and state help define the publication, and you will be seeking out those voices. Pitching and developing long-form stories – We want to help you get published, we want to see you succeed. We’ll help you get there in any way possible, and provide guidance to continue your professional career in any different facets of the media industry. We can help with career counseling and help you build your resume to move forward into a media environment. Interns work remotely on 1-2 articles per week, interviewing sources in person or via phone on feature pieces. Get access to shows, parties, and events of your choice throughout Virginia. Have your name published in Virginia’s largest independent media, with long- and short-form writing experience. Have the independence to cover stories and issues that interest you. Pitch your ideas and don’t hold back your creativity: We want to hear your voice and uplift the voices of our community that aren’t usually heard. Editorial jobs are mostly performed remotely, with a once-weekly editorial meeting to update projects. We are looking for several individuals to join the team in multimedia, ranging from filming artist promotional shoots to storytelling in various pieces. Multimedia jobs are remote, and assignments will be sent to interns as needed once branding needs are established in a meeting. Video: Ideally pitch, shoot, edit and produce compelling video on breaking news and feature stories with RVAMag, GayRVA, and social media across either. Graphic Design: Design weekly article images, amount depending on required credit hours. Weekly work is flexible for multimedia interns — tell us what you’re looking for. Candidates should be studying journalism, graphic design, film, or other related fields, but all applicants with video or multimedia experience will be considered. Must have strong narrative storytelling skills, ability to meet deadlines, and ability to work with video team. Those who own or are familiar with a DSLR camera will be considered first. Experience with Final Cut Pro, Final Cut X or similar video editing software a plus. Please send applications to Caley Sturgill at [email protected] and write “Internship Submission” as the subject line. Deadline for submission is December 28 (flexible if needed — send an email letting us know beforehand if you plan to submit a late application).